While in college, Barthell Joseph made several trips to the home of a friend whose family owned property near Hollandale, Mississippi, close to the Mississippi River. Joseph and his friend would spend their mornings in the rice fields hunting ducks and their afternoons telling stories and relaxing by the fire. "I enjoyed myself so much on these trips, I knew I would come back to this area after I finished school." He moved back home to Greenville in the early 1990s to work in a small business and several years later bought an 80 acre farm a few miles from Greenville. But Joseph was more interested in duck hunting than farming. The farm, near Black Bayou, is part of a major flyway for migrating ducks and geese. Its wetlands, some of which are created by flooded rice fields, are a favorite stop for wintering waterfowl. "I got involved in the farming business because the ducks on this property were super." Working and operating a small farm was a lot of work, but Joseph enjoyed taking care of the property and hunting ducks on cool winter days. In 2000 Joseph applied for the Wetlands Reserve Program. Although his stewardship has been a blessing for migrating birds each winter, its value to ducks and geese could be improved. Since the 1950s, waterfowl populations have declined in part because of the loss of wetlands along the Mississippi River and other parts of the country. The Natural Resources Conservation Service (NRCS), the U.S. Fish and Wildlife Service, the Mississippi Fish and Wildlife Foundation and Ducks Unlimited work to protect and restore habitat for these birds through programs like the Lower Mississippi Valley Joint Venture's Mississippi Partners Project. This program provides technical assistance and shares costs with landowners who enhance, create or restore wetlands. As a participant in the Mississippi Partner's Project, Joseph developed a strong friendship with Ron Hudspeth, the District Conservationist at the NRCS office in Greenville. With the help from the Mississippi Partners Project, Joseph installed water control structures that flood large parts of his farm for migrating birds during the winter. When the 1990 Farm Bill created the Wetlands Reserve Program (WRP), Barthell Joseph immediately recognized that his land would be a good candidate for the program. The WRP authorized the NRCS to restore and protect one million seventy-five thousand acres of agricultural wetlands across the country. The NRCS can pay Mississippi landowners the appraised agricultural value of their property, up to $750 dollars per acre, for perpetual conservation easements. WRP participants also receive technical and financial assistance for habitat restoration and improvement projects. Joseph enrolled the 80 acres of soybean land in the WRP. The easement will be permanent. "In the last few years, our rental payments provided us a little extra funds. Now I want to concentrate on what's best for wildlife and for me and my family." Now that the agreement is finalized, Joseph still owns the property. He will continue his stewardship of the farm, including managing for waterfowl. Joseph will plant 5% of the tract, or four acres per year in food plots for wildlife and continue to hunt on his land. According to the requirements of WRP, the property can no longer be used for crops, but Joseph retains income from hunting or fishing leases and ownership of mineral rights. The WRP requires the NRCS, the U.S. Fish and Wildlife Service and the landowner to agree on a management plan for WRP property. Management plans take into account vegetation, hydrology and soil types for wetlands restoration projects. Joseph's plan divides his property into shallow wetlands, green tree reservoirs and bottomland hardwood forests. Financial assistance from the WRP will pay for the reforestation of 55 acres. "I am excited that I can keep the property as long as I want without putting more money into it. Without the WRP I probably would have sold this place," explains Joseph. 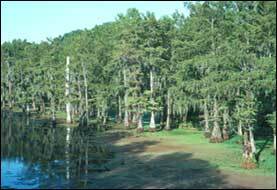 As of May 2002 over 100,000 acres of conservation easements have been enrolled in the WRP in Mississippi. For more information on the WRP, contact the Natural Resources Conservation Service at (601) 965-5203.